I wish, Nokia Lumia Model with same Specs: Dimensions: 123.5x58.5x7.5 mm, Body: Aluminum by side and back, Display: 4 inch, Cameras: 16Mpxel/5Mpxel and Flash, Battery: 2460Amp, Resolution: 800x1600, Weight: 115, USB: v4. Reversible, Network: all 2G, 3G, HSPA, CDMA, LTE, etc.., Operating Sys: Windows 10 or Up, a may meadows Iphone 5se form. Over 24 months of usage and no issues at all. Even batterylife seems to be improved after the W10 mobile update. Really good phone and still a bargain now for the specs you get. About four months after buying this phone it became unstable. Phantom swipes between apps, made phantom calls and screen was unresponsive making it unusable. Very disappointed. I have this mobile, it is good but easily heating when browsing the internet, using facebook and instagram. 2160p video recording is already added during the WP8.1 update, so it should be deleted from the "main disadvantages" headline. If Nokia had gone with Android, most likely it would have a much larger market share than it does now but on the other hand from a financial point of view I don't think that it would be any better sine if anyone has a look at the financial reports of the manufacturers which embraced Android will realise that only Samsung, with all its in house development and manufacturing capability accounts for only 5% of the total profits in the smartphone industry, with the remaining 95% going into Apple, while all the remaining Android smartphone manufacturers try not to have losses in the best case scenario. In addition, Nokia itself has admitted in the past that Samsung was the main reason that it decided not to go with Android in the first place since if it did it would have to compete directly with it, something that even Nokia with all its technology and manufacturing capability was afraid of doing. In the end, regardless of what happened, judging by the position in which companies such as Sony, Motorola & HTC are in the moment, I believe that Nokia took the right decision to try to avoid Samsung as a direct competitor, meaning producing smartphones with the same operating system in which additionally neither would be able to influence its development. Hello everyone. I'm really into buying this phone because I like found the display very addicting and I trust Microsoft for security, stability and quality (as well as the actual price). My thing is that I'm a very obsessed with high quality music and the review writtes that this phone could not afford this. Does anyone of you has any different experience with music listening? lumia 930, 11 Feb 2015Cortana doesn't work with my 930 tried all combinations. I'm based in Saudi.. any suggestions.. Try changing your region in the settings menu... unless your locked. Had this foe 4 months and it is the worst phone ever.. This is mot smart phone..buy it if u only use it to attend calls..
Heats up in 5mins in causal browsing. Video call possible only with Skype. Can't edit or attach while reply or forward emails. Camera is ok...low light pics r horrible. Only one plus is that phone and display is good. One bad new of this handset is that this handset is not a 4G compatible handset in India as I checked with Airtel, who is the lone provider of 4G services as of now. The operator confirmed that it has two specs required for 4G connections and they are TDD and FDD...this handset complies with FDD as 2300 mega hertz, but airtel has an TDD at a bandwidth of 40,which is not avl in this phone. May be diff operators would have different band .But am upset as I bought this handset only for 4g services...Does anyone has anymore update on this topic. 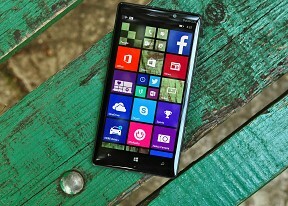 Where can I purchase the Lumia 930 unlocked? iks, 02 Mar 2015Had Lumia900 before and here are couple of concerns whether to upgrade or not. Dealership coul... moreHad Lumia900 before and here are couple of concerns whether to upgrade or not. Dealership couldnt give the answers so here i am. 1. Any notification led to indicate a missed call, text w/o activating screen? 2. Option to set different volume levels on alarm, media, call? 3. Scroll bar next to list of contacts (say you have 800 contacts to swipe through is weird the least)? 4. Keep skype, fb messenger active and receive messages when you switch off the screen or surf in other apps? super awesome device in gold it's super nice windows 10 for phones will be hot on this device. lumia 930, 11 Feb 2015Cortana doesn't work with my 930 tried all combinations. I'm based in Saudi.. any suggestions.. Hi, try to set up US in regions, then Cortana should work fine. Good luck !